It’s no secret that Michael and I love to visit New York anytime we get the chance! The city just has so much to offer in the way of food, the arts, and fun-to-explore neighborhoods. Every trip, we pick one New York neighborhood of and spend an entire day walking around, discovering the unique things it has to offer. We’ve previously shared our experiences visiting the Upper West Side, Lower East Side, and Lower Manhattan's Battery Park City. 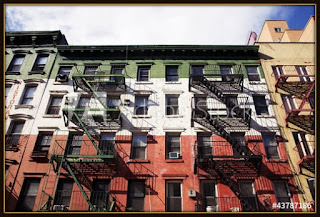 Today, I want to share our experience exploring the area of SoHo and Nolita this Summer. 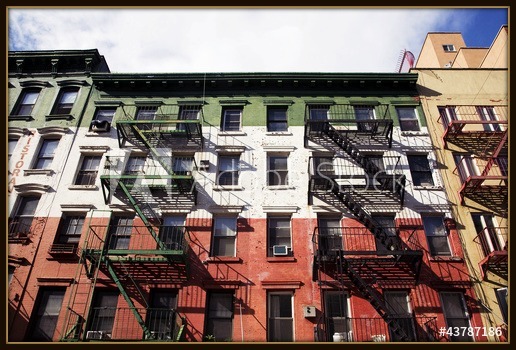 Whether you love to power shop, eat great food, or just people watch…this fun New York neighborhood will definitely deliver! 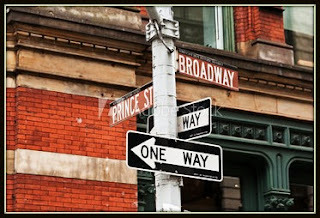 The intersection of Broadway and Prince Streets is a great place to start your walking tour of this bustling neighborhood. We started our day in SoHo with morning pastries at Ladurée, the second New York location of the renowned Paris bakery. Unlike the jewel box-sized Upper East Side location, the SoHo location features a large dining room and a full menu of both sweet and savory dishes -- in addition to a large bakery display case. Michael and I admired the beutifully decorated pastries in the display case…trying to select one each to try. I opted for the feminine Rose & Raspberry Saint-Honore. It featured puff pastry, rose petal cream, raspberry compote, rose-scented Chantilly cream, and raspberries. It was truly heavenly, with a subtle rose flavor that was more like a whisper in the back of my nose. Each bite was pure pastry perfection! 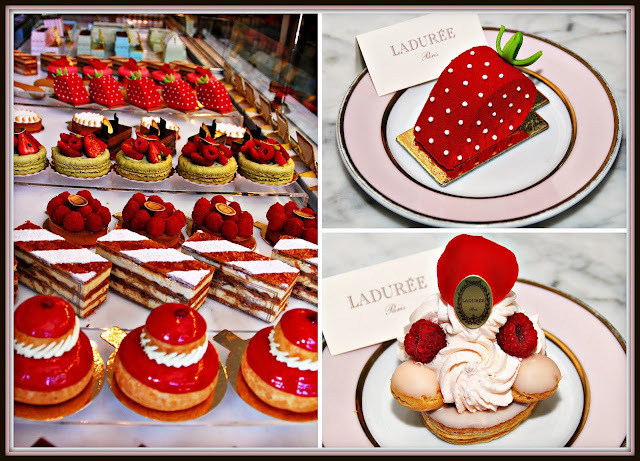 Michael picked one of the most gorgeous pastries I’ve ever seen – the La Fraise Strawberry cake. Both of our pastries were like exquisite works of art…almost too pretty to eat. We somehow managed to cut into them, though. As you can see, Michael's La Fraise looked exactly like a gigantic strawberry -- complete with a green marzipan stem. Inside was cake, cream, and strawberry jam. 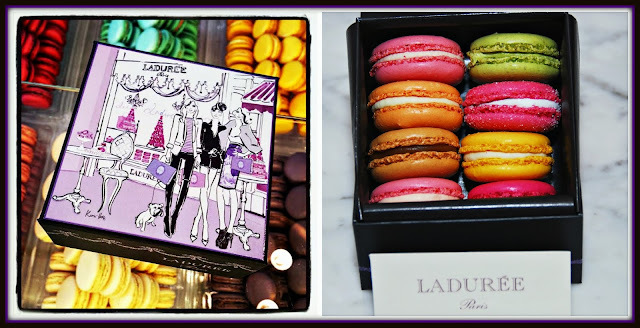 Before we left Ladurée, I hand selected some of their amazing macarons to bring back home. Ladurée macarons are some of the best in the world and come in amazing flavors like Rose Petal, Pistachio, and Salted Caramel. The friendly staff packed my cookies in a stylish gift box that ensured they made it safely back to Texas! While we ate our pastries, Michael discovered that there was a Leica camera store just a few blocks away, so we decided to pop in and check it out! 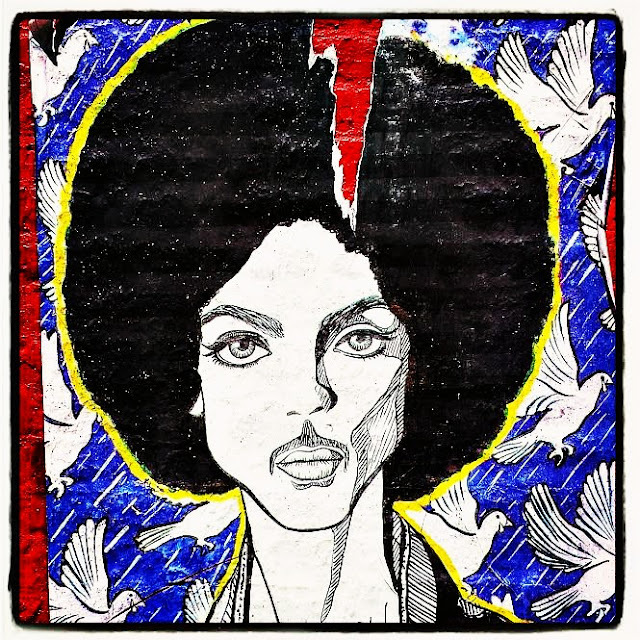 On our way to the camera store, we discovered an amazing hand-painted mural dedicated to Prince on the outside of a building. That’s always one of the very best parts of exploring New York on foot – you truly never know what fun thing you’ll stumble upon along the way! Here's another example of that. On our way to the camera store, we were excited to discover the fun and unique Chobani SoHo Cafe . Despite having just eaten pastries, we had to go inside to check it out! 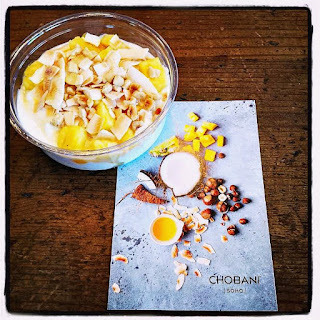 Turns out, they offer a creative menu of both sweet and savory Chobani Greek yogurt bowls in two sizes. Michael and I decided to share the tropical-inspired Pineapple Coconut Agave since we had lunch plans in a couple of hours. It was so good! Creamy Greek yogurt was topped with juicy fresh pineapple, toasted coconut, and a drizzle of agave. I hope Chobani expands this healthy concept nationwide, because this location was definitely popular! From there, we headed to the camera shop to dream of camera upgrades. Before we knew it, it was time for us to start the 30-minute walk to Lombardi’s Pizza in adjacent Nolita for lunch. We made it to Lombardi’s for lunch and were warmly welcomed by the manager. 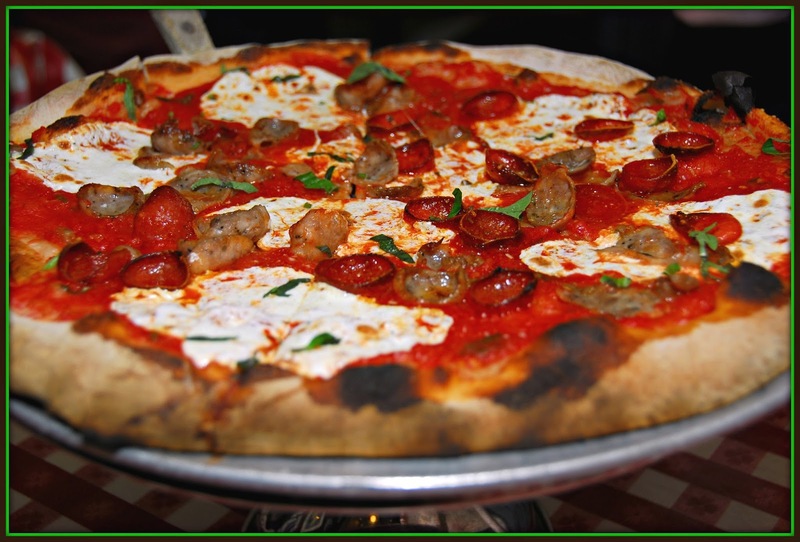 For pizza lovers, eating pizza at Lombardi’s is a definite must for any New York visit! That's because Lombardi’s is literally the very first pizzeria in the U.S., opening in 1905. Thanks in large part to Lombardi’s, pizza is now an American culinary institution. Michael and I have eaten here several times before, and we’re always impressed with the consistent quality and amazing taste of the pizzas that come from Lombardi’s original coal-burning oven. We normally keep it simple and order sodas and pizza. However, this time we opted to try one of their signature appetizers: Grandma Grace’s Meatballs. While we waited for our pepperoni and sausage pizza to cook in Lombardi’s coal-fired oven, we dug into two of the largest meatballs we’ve ever seen -- 4 ounces each! They were juicy and full of flavor – and the house-made tomato sauce that accompanied them was robust and flavorful. These are some of the most tender, moist meatballs that we’ve ever tasted! Then…out came our pizza! Lombardi’s pizza features a flavorful crust that’s charred in spots by the oven. It’s topped with robust San Marzano tomato sauce, fresh mozzarella, basil, pepperoni, and sliced sweet Italian sausage. This is truly pilgrimage-worthy pizza! Trust me when I say that Lombardi’s more than lives up to its hype. In a city that's full of pizza joints, Lombardi's is definitely a must-visit pizzeria for any New York trip. As we were leaving, the manager had a foodie tip for us. He told us about a great homemade artisan Greek yogurt shop that was a quick 10-minute walk away. We decided to take his recommendation and give Greecologies a try…and boy were we glad! 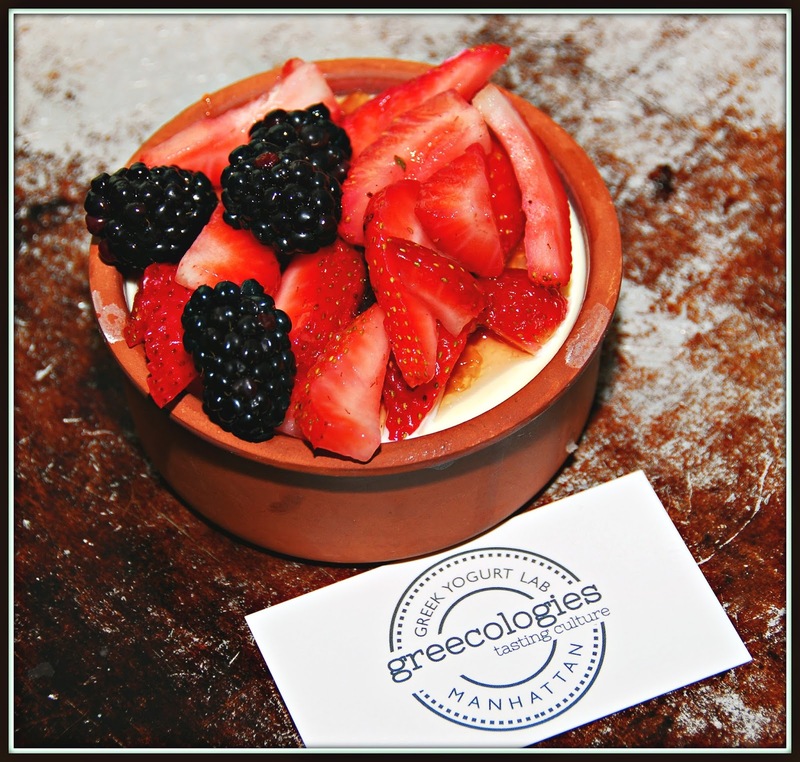 Greecologies makes their own artisan Greek yogurt in house from grass-fed cow. The fresh-made yogurt comes served in terra cotta bowls and is topped with a variety of creative sweet and savory toppings. Michael and I split the fluffy traditional yogurt that was topped with house-made rose-infused preserves and fresh Summer berries. It was an explosion of flavor -- and a healthy afternoon treat. We just love discovering new foodie finds wandering the streets of New York! With that, our day-long visit to SoHo and Nolita was over. It was time to head back uptown to our digs at the Library Hotel. Be sure to come back next week to hear about the rest of the New York leg of our Summer 2o16 East Coast adventure! Disclosure: Ladurée hosted us for pastries, and Lombardi's hosted us for lunch, to facilitate inclusion in this article. We were not hosted by Chobani or Greecologies, but we enjoyed discovering them so much that we wanted to share the experiences with our readers. All opinions expressed are solely my own. Unless noted, all photographs are copyrighted by Michael K. Garcia. they may not be copied or otherwise used without prior permission.